This review is part of my week of facial cleanser reviews! 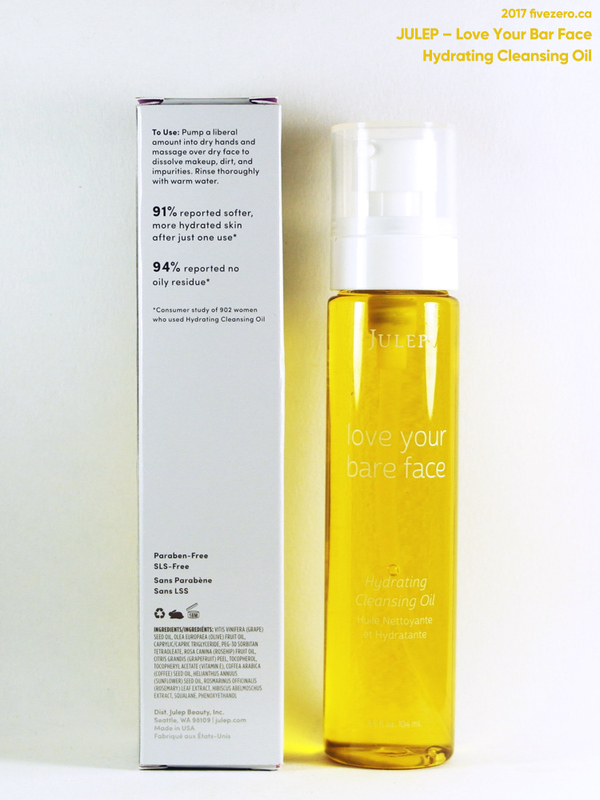 The fourth face cleanser I’m reviewing this week is another cleansing oil, this time from Julep, an American brand. They started off making nail polish, but have successfully expanded their line to include makeup and skincare, and their skincare in particular is inspired by Korean beauty (Julep founder Jane Park is Korean-American). You’ll find in their skincare lineup products like cleansing sticks, konjac sponges, sheet masks, and the first item of Julep skincare I’ve tried: Love Your Bare Face Hydrating Cleansing Oil. A lightweight, antioxidant-rich oil blend that melts away makeup and impurities without stripping your skin. This Korean skincare secret is formulated for all skin types. To use: Pump into dry hands and massage over dry face to dissolve makeup, dirt, and impurities. Rinse thoroughly with warm water. For best results, use with a Konjac Sponge. At this point, I’ve still only used three cleansing oils: Josie Maran Argan Cleansing Oil, The Face Shop Rice Water Bright Cleansing Light Oil, and Julep Love Your Bare Face. Josie Maran’s has a thick, honey-like texture; The Face Shop’s has a runny, liquid texture. Julep’s is closer to Josie Maran’s, but maybe a smidge less thick, which means it doesn’t drag as much when applied on dry skin. Like Josie Maran’s, it also has a similar citrus-y smell and yellow hue. In this review, I’ll be comparing Julep’s cleansing oil a lot with Josie Maran’s cleansing oil, since I found the two of them to be fairly similar in texture and performance. The similar scent comes down to the grapefruit oil used in both cleansing oils. However, Josie Maran’s main oil ingredients are sunflower seed oil, safflower seed oil, and argan oil; Julep’s are grapeseed oil, olive oil, and rosehip oil. I’ve personally found rosehip oil to be very helpful for my skin, though I don’t know how much good it does being applied briefly as a cleansing oil. (The same goes for argan oil in Josie Maran’s, except that my skin doesn’t really respond to that particular oil.) Julep’s cleanser also contains a small amount of squalane, which also works well for my skin in higher concentration. About two pumps of Love Your Bare Face Cleansing Oil worked well to remove the makeup on my face (it even handles waterproof mascara to a certain extent). I always use my cleansing oils with just my fingers; Julep recommends using their konjac sponge, which I have not yet tried. I found that I did like this cleansing oil a little better than the Josie Maran cleansing oil, which I found a bit too thick and more difficult to emulsify properly. Love Your Bare Face Cleansing Oil emulsifies somewhat more easily, and is therefore easier to wash off the skin. I still double-cleanse when using this, though—at the very least with a micellar water to remove any remaining oil. The cleansing oil does claim to be hydrating, but I did not find it to be any more or less hydrating than the two other cleansing oils I’ve tried. It probably doesn’t help that I have to double-cleanse with cleansing oils. As I said in my review of The Face Shop’s cleansing oil, yesterday, I am starting to prefer cleansing balms over cleansing oils, so I doubt I will repurchase this product or any other cleansing oil. That said, if you do like cleansing oils—particularly ones that are thicker—definitely give this a try! The pump dispenser is also very tidy. The unit price of Julep’s cleansing oil is $26.92 / 100 mL; Josie Maran’s argan cleansing oil in the large 180 mL size is actually a better deal at $17.78 / 100 mL cleansing oil. That said, Julep Maven subscribers do get lower regular prices (working out to $21.54 / 100 mL) and better sales…but Josie Maran products occasionally go on sale, too. Overall, I like Julep’s cleansing oil slightly better, but I am feeling that cleansing oils aren’t really for me. Love Your Bare Face Hydrating Cleansing Oil* retails for US$28 ($22.40 for subscribed Mavens) and contains 104 mL. The formula does not contain parabens or sulfates. It is made in the USA. Julep Beauty, Inc.* was founded in 2007 by business executive Jane Park. It started as a chain of nail salons in the Seattle, WA, area; by 2008, the company was online. The Julep Maven subscription service was launched in 2011. The company is cruelty-free, its nail colors are vegan (other products aren’t necessarily), and it remains based in Seattle, WA, USA. I’ve never tried using a konjac sponge with cleansing oils – hrm! I’m a fan of cleansing oils and a thicker consistency so this one is probably up my alley! I thought it was weird to use a konjac sponge with a cleansing oil! Would that be annoying to clean? Haha, no it’s ok! I’ve got so many cleaners (NOT cleansers! 😉 ) in my stash. But thank you! I’d imagine it wouldn’t be too difficult to clean the konjac sponge since the oil would emulsify? I know the feeling…I’ve stopped buying almost any skincare and makeup, now. Of course, now Mr FZ wants me to re-order the COSRX low pH cleanSer (heh). After I placed my “last” Jolse order for a while.